About 10km from Yichang is the “Three Visitors’ Cave”. In 819, three Tang Dynasty poets were traveling the Three Gorges area. While enjoying the spectacular scenery, they inscribed some poems on the cave walls. 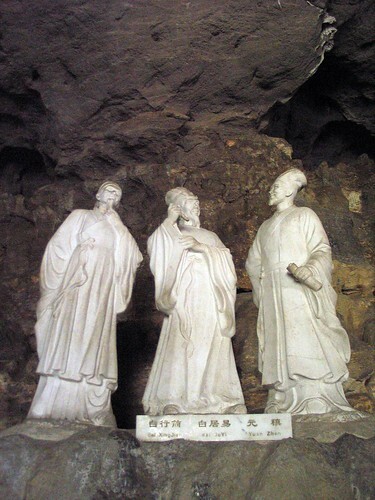 During the Song dynasty, three more famous poets visited the cave and carved a few poems on the wall. Since this time the Three Visitors’ Cave has been a famous tourist spot in China. Pictured are a representation of the first three poets within the cave. 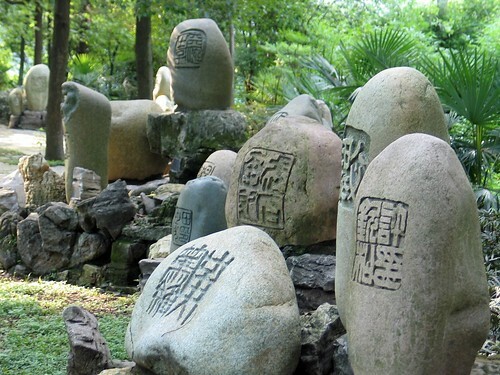 Within the Three Visitors’ Cave park, we found this grassy area with hundreds of name chops carved into large Yangtze river stones. We haven’t seen anything like this elsewhere in China.